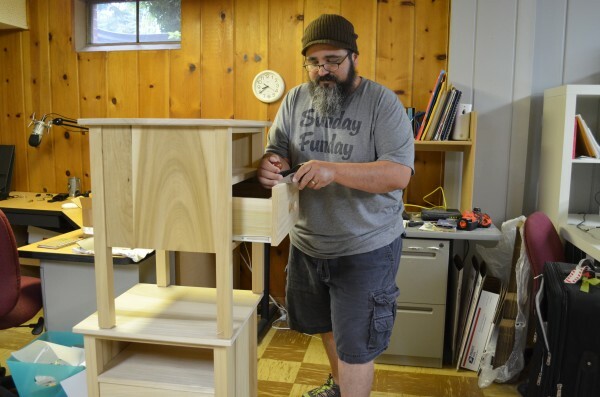 I’m sure you all remember the bedside tables I built for me and Samantha (if not, here’s a link where you can checkout the first episode in the series.) Many of you have asked what finish we went with, and I probably replied we plan to paint them…as soon as Sam figures out which shade of white she prefers. Well, as things tend to happen around a busy household like ours, they have yet to be painted (sorry if I gave the impression to anyone who’s asked that they were completed.) The truth is, we’re just finally getting around to it…they might even be done by Thanksgiving this year! Perhaps it’s a good thing they did sit this long unfinished? As it turns out, the drawer fronts needed to be a tad bit narrower than they were. How’d I figure that out? Easy, by attempting to open them. They were so tight, I seriously thought I’d rip the handle off long before it would budge open! Does this mean my design was flawed or that I’m a horrible woodworker masquerading as an expert? Nope, it just means I should’ve been more willing to accept a wider gap on the top and bottom of the drawer. If you remember correctly, I started the tables in November and wrapped it all up in January. And around my neck of the woods that’s the time of year wood tends to be contracted the most. So what looks like a WAY TOO GAPPY opening to the naked eye, is probably spot on when the expansion seasons of late Spring and Summer roll around. 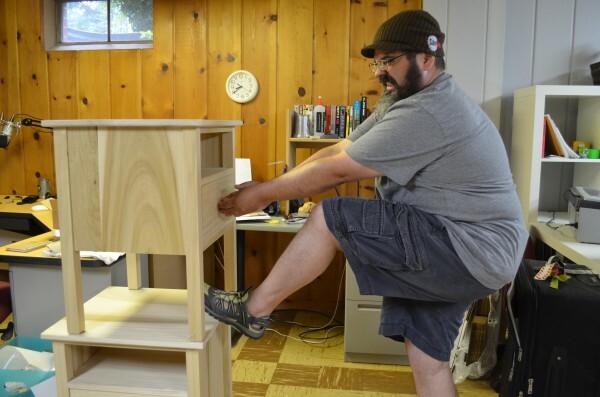 Thankfully, since we still hadn’t painted them, it was a matter of carefully prying the drawers open and planing a little off the top-edge where it stuck the most. A couple of passes and they slid into place just as I had intended them to. Worst-case-scenario? I would have already painted or stained them and then had to do a little touch up work. No biggee really, but not something I want to do frequently. It’s just another reason to remind myself to “Mind the Gap” when I’m fitting inset doors and drawers. One solution to this problem is that I’m planning to use scraps of the most common woods I use in my projects as wood movement gauges. How? Wood movement is predominenently an issue across the width of a board (there are exceptions to the rule we can talk about later.) 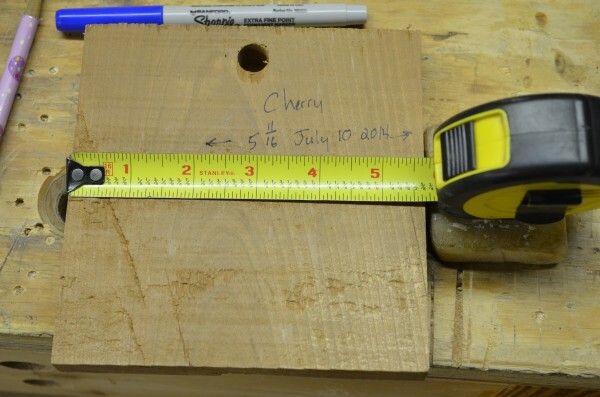 My solution is to take an off-cut at least 4-6″ wide, measure it with my favorite tape measure. Note the day of the month and set it aside. Then I’ll measure it again each month on the same day and keep track of any changes. It’s not the perfect solution, but it’s quick and easy and can help me gauge just how much gap I might need the next time. What’s your solution? Please share in the comments below. I’d love to get some more ideas. I’m glad I live in Los Angeles. I don’t think I’ve ever had a wood movement issue, but I’m always thinking about it. I take it back, I made a tambor door breadbox that had a slide out cutting board, it was only about 10 inches deep. So I made it out of one board, without cutting it into strips and alternating the growth rings …… and SHAZAM, that puppy cupped on me. That has been my only issue with wood movement. If I ever move to Alaska, I can’t take any of my wood projects with me. I think one of my favorite stories of wood movement is from David Marks. I seem to remember him telling a story about making some amazing wooden faced clocks for a large retailer and then them contacting him regarding ones that were sent all over the country. Unfortunately they weren’t stories of satisfied customers singing his praise LOL! Apparently that lesson in wood movement was the only one he needed.